Today we’re rejoining author, pastor and evangelist Greg Laurie. Click here for his devotional and blog page, or click the title below for this article. Dr. Leslie Weatherhead calculated the average length of a life using the hours of one day to illustrate the importance of recognizing the value of time. He concluded that if your age is 15, the time is 10:25 a.m. If your age is 20, the time is 11:34. If your age is 25, the time is 12:42 p.m. If you’re 30, the time is 1:51. If you’re 35, the time is 3:00. If you’re 40 the time is 4:08. At age 45, the time is 5:15. If you’re 50, the time is 6:25. By age 55, the time is 7:24. If you’re 60, the time is 8:42. If you’re 65, the time is 9:51. And if you you’re 70 the time is 11 p.m.
Ephesians 5:15 says, “So be careful how you live. Don’t live like fools, but like those who are wise” (NLT). Jesus told the story of a man who went on a journey and left his money with his servants. This was not an uncommon thing in those days. A wealthy man or a ruler would have many servants in his household, from those who performed basic labor to those who managed the financial affairs of his household, even his business. In many cases some of the man’s servants would be better educated and skilled than he was. Highly trusted slaves had a virtual free hand within prescribed areas of responsibility while the owner was at home. When the owner would go on a journey, he would leave full authority in the hands of these key servants, who would have the ancient equivalent of a power of attorney. So Jesus described a scenario in which a wealthy man went on a journey and left the key servants in charge of his possessions. It’s difficult for us to know exactly what sum he left them, but one possibility is that he gave the equivalent of $5,000 to the first servant, $2,000 to the second servant, and $1,000 to the third. What is Jesus’ story saying to us? I think it’s quite obvious. Jesus is like that wealthy man who goes on a journey, which spans the day he left this earth to the day he returns in the Second Coming. We are the servants he has invested in, and we are to take what he has given us and use it for his glory while we await his return. In the New Testament a word that is often used for “slave” or “servant” is the Greek word doulos. It’s a term that describes a unique class of servant, not someone who was made that way by constraint or by force. A doulos was someone who had been freed by their master yet still chose to serve out of love. The servant was so thankful for this pardon that he or she would willfully choose to serve. The apostle Paul often referred to himself as a doulos, and that is what we are as followers of Jesus Christ. Christ has paid an incredible debt for us. He has pardoned us. He has forgiven us. And now we should become his voluntary servants, not because we have to but because we want to – because we love him. We recognize that he has instilled certain things in our lives that we are to use for his glory. Certain gifts. Certain talents. Certain resources. Everything. Paul wrote, “Don’t you realize that your body is the temple of the Holy Spirit, who lives in you and was given to you by God? You do not belong to yourself, for God bought you with a high price. So you must honor God with your body” (1 Corinthians 6:19–20 NLT). Jesus said, “If any of you wants to be my follower, you must give up your own way, take up your cross daily, and follow me” (Luke 9:23 NLT). This doesn’t mean that we must take a vow of poverty. It simply means we recognize that it all belongs to God. Our lives belong to God. Our families belong to God. Our possessions belong to God. Everything is his. In Jesus’ story, the first servant took what he had, invested it, and received a 100 percent return. He doubled his master’s investment. The second, though he had less, did the same thing. This demonstrates that it isn’t a person’s talent that matters as much as how he or she uses that talent. God never demands from us the abilities we don’t have. But He does demand that we should use, to the full, the abilities that we do possess. We may not be equal in talent, but we should be equal in effort. Take what God has given to you and do the most that you can with it for his glory. God can do a lot with a little. If you don’t believe me, just ask the boy with the five loaves and two fish who gave everything he had to Jesus. It didn’t seem like a lot, but Jesus used them to feed a hungry multitude. Jesus can take a little, bless it and multiply it. He can use it beyond our wildest dreams. If we will humble ourselves, take what we have and offer it to God, if we will be willing to do what he has placed before us and be faithful in the little things, then he will give us more to do. I would rather try and fail than never try at all. Any time you take a chance, you can fail. But it’s better to try than to never take chances and never have anything happen in your life. So seize the day. Seize the moment. Seize the opportunities before you. Don’t put it off too long, because you may not have as much time as you think. Be productive with your life. Be productive with your time. Seize the opportunities God has given you. Is this a misunderstanding of the concept affecting his generation, or have we failed as parents? Do we ever feel that way when we do things for God? I thought about when reading this article by Jonathan Parrish who writes at Walking With Christ Daily, now in its 6th year. To read this at source and then check out their archives, click the title below. Tonight while doing my devotional God took the time to remind me what He owes me or any other person. God owes me nothing. There is nothing that I can give or do for God that would require God to owe me a favor or something in return. Lets take a look a single moment in the book of Job. “Who has first given to me, that I should repay him? God owns everything. We forget that so often when things don’t go our way. Everything around us, belongs to God. God is allowing us to be stewards of His stuff while we are here on earth. We are stewards of his money, we are stewards of the Gospel, we are stewards of our families and what ever else you can think of. God has given us everything including our salvation and His mercy. So the next time you think God owes you something just remember he has already given you everything. 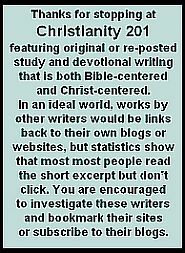 Mission Statement: Christianity 201 is a melting-pot of devotional and Bible study content from across the widest range of Christian blogs and websites. Sometimes two posts may follow on consecutive days by authors with very different doctrinal perspectives. The Kingdom of God is so much bigger than the small portion of it we can see from our personal vantage point, and one of the purposes of C201 is to allow readers a ‘macro’ view of the many ministries and individual voices available for reading. Usage: Items written by Paul Wilkinson contain no links and you are free to use the material provided you link back to C201 and don’t change the wording of quoted sections. For other writers, follow the link in the title and then see if their policies apply to what your planning. Writers: We’re always looking for contributions. Check out the ‘submissions’ page. If my schedule permits, I do prefer writing these devotional studies myself rather than importing than from the various sources we use in the course of a year. I find doing so forces me to spend time in scripture, immersed in a particular theme. If you’re at a small group meeting and you contribute something verbally, it’s much easier to just say it than to have to commit to print. Knowing the words will be here for successive hours, days, months and years means fine tuning what it is you really intend to express. But regular readers here will notice a disconnect between the words “forces me” and what we talked about in the last Sunday Worship column, which involves doing things wholeheartedly out of joy and delight. If you missed, you can read that article here. Just because I love to do something doesn’t mean I do not face the busyness and distractions common to us all. However doing something joyfully can also mean that, while I see the benefit which occurs in my life by spending time in God’s word (versus the days I don’t get to do this) it doesn’t mean I have organized my life to the point where this flows naturally into my daily schedule. For you that might mean blocking out the time in your daily schedule; for me that means facing a 5:31 PM deadline each day knowing that subscribers are expecting something in their in-box. And so it is we speak of spiritual disciplines. This term really grates on some people because of childhood memories of what constitutes discipline, namely punishment. (Often this intersects with the category of people who have problems with seeing God as Father, again because of painful memories.) I much prefer the term spiritual practices. 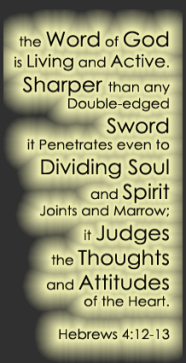 Another verse which evokes negative images for people is 2 Timothy 2:15, at least in the way many of us learned it as children: “Study to shew thyself approved unto God, a workman that needeth not to be ashamed, rightly dividing the word of truth.” (KJV) Besides “shew” and “needeth,” the issue is actually the choice of the word “study” which is not used by other translations that are not derivatives of the KJV. “Study” tends to remind us of cramming for an exam. It’s not a positive image for many people, especially people who didn’t do well in school! Again, since we’re using the NET Bible today, better to go with, “Make every effort to present yourself before God as a proven worker who does not need to be ashamed, teaching the message of truth accurately.” It’s talking about diligence; applying ourselves to present our best to God. The term “spiritual discipline” is a frequently used tag on this site, but though it’s often covered here, I wanted to end with this list, posted in 2012 at the website Soul Shepherding for those less familiar with the concept. The author is Bill Gaultiere. Today a short excerpt from the blog of Youth Unlimited. (This is a different YU than the one associated with Youth for Christ.) Click the title to read at source. Elijah- He spent some serious time in prayer and it changed the weather for THREE YEARS! You know the weather, that thing everyone acknowledges is totally out of our control… Elijah affected it through the power of prayer and he was just a guy like us. Moses- This guy got asked to do big things by God and had some serious doubts about his own ability. “10 But Moses said to the Lord, ‘Oh, my Lord, I am not eloquent, either in the past or since you have spoken to your servant, but I am slow of speech and of tongue.’”– Exodus 4:10. But when he put his faith and trust in the Lord’s power working through him, he was able to lead the Israelites out of Egypt through the Red Sea which he separated to make a dry path. Wow, that is a big dream that God used “un-eloquent” Moses for. Gideon- Gideon was from a small clan that was being ruled and terrorized by a bigger clan, the Midianites. He was scared and felt hopeless when an angel appeared to him and told him that if he went and stood up against the enemy the Lord would make sure he won! Crazy. Sometimes we return to previous blog posts from other years. One we used a long time ago was the newsletter from author and missionary Elizabeth Elliot. To keep and cultivate . As it happens, one day Abe is sitting in front of his tent during the hottest part of the afternoon, sipping sweet tea and listening to the tree frogs, when he looks up and notices three men standing nearby. He must have figured they weren’t normal beings since one moment no one is there and the next moment they’re standing nearby. Since he didn’t see them approaching from the distance, their appearance is Abe’s first clue to be nice. As I was reading this, I wondered why Abraham would go to all this trouble. Undoubtedly, Abraham and Sarah had food in the tent. They weren’t poor and lacking. With all the people Abraham had in his company, it is inconceivable that there wasn’t some meat and bread in the pantry left over from last night’s dinner. But that isn’t the way of Abraham. Instead, he makes sure to prepare the freshest food for the Lord. He didn’t give his guests day-old bread and yesterday’s meat, but warm bread and a tender calf. It was a lot of effort and time, but the Lord is gracious to Abraham and allows him the time necessary to make the arrangements. I wonder: How often does God get my leftovers because I’m too stingy, lazy, preoccupied or even self-conscious to arrange to give Him my best? Sure, I may be thinking I don’t want to try the Lord’s patience by making Him wait until I’ve prepared, but this scene with Abraham tells me that the Lord is already prepared to wait for me to give my best. I’m the only one who is in a hurry. I also see that giving my best means I may impose upon others in order to give the best, the way Abe got Sarah and the servant involved in the meal. It means that in order for me to give God the best I have to give, I sometimes need the help of other people. Abraham never hesitated to ask for help in giving to the Lord. That is something I need to learn. Abraham’s reaction to the Lord’s presence in his home is a reminder that: 1) God knows who I am, 2) God’s knows where I live, and 3) God is prepared to wait for my best. I may be impatient to “get on with it,” but the Lord is not in a hurry to receive my leftovers. If the Lord is willing to wait for me, I should be willing to give Him my best. Behind the scenes at C201 is my wife, Ruth Wilkinson who is often involved in the preparation of this daily devotional study through discussions about a particular writer’s perspective or additional research into the context or meaning of verses. Also, on the days you see a longer excerpt from a print source, it’s probably Ruth who typed it out. So today I wanted to do something I’ve never done here, which is to say thanks and wish her a Happy Birthday. On July 16, 1969, Apollo 11 blasted off from Florida and would land on the moon just four days later. While the spacecraft had a very sophisticated computer navigation system, this was the 1960s after all and today, I’m told that I have more processing power and functionality in the small smartphone which fits in my pocket. Similarly, on the day that I trusted Christ as my savior and promised to make him my Lord, I had only limited knowledge of scripture and awareness of the gifts God had given me, but today, as I endeavor to mature in Christ, hopefully I have much more potential spiritual power and ability to be his witness in the world. Unfortunately, I will never understand everything that my phone is capable of doing. There are things wired into it (even though I realize there are no actual wires anymore) that are beyond my understanding. Similarly, there are are things that God has wired me for, so to speak, that I can choose to apply or use, or allow those gifts to atrophy. Sometimes, only as I step out in faith will I know the resident potential that exists. In a world before time, God “planned” us for “good things” and the resident potential within us is great. So she takes action, but not the way I might have done it. I would have walked into the king’s chamber and said, “We need to talk.” But instead she proposes a banquet and then another. Her nation is in peril of extinction and she throws a party! Her internal wiring and predisposition is such that she is able to devise a plan and make a difference. We will never know what we’re wired for and what potential we have until we put ourselves out there and take action. It’s also good to remember that we are image bearers of a creator God whose attributes we only scratch the surface of understanding. I don’t believe that we should start claiming a false promise that we can do what only God can do, nor should we buy into the idea of unlimited human potential, but we need to take the encouragement that we were created by a God of infinite capacity. Are there things in your internal wiring that you haven’t discovered or haven’t used? A gift God has given you which you haven’t tapped into? This wasn’t planned, or I would have run them back-to-back, but today’s devotional pairs well with the one from May 2nd, Lest Anyone Should Boast. The writer is Mark McIntyre at the blog Attempts at Honesty who has appeared here previously. To read this at source, click the title below. For believers, if we are to boast at all, let it be boasting about the God we serve. Let us boast about that God makes himself understandable to us. Let us boast that God allows us to know him and be in relationship with him. We have a reason for boasting, but that reason is not us. Let us boast about God’s character. If we understand God’s character and boast about it, some of that character is bound to rub off on us. Please look at the list that is given in the verses above. If ware know God and are in relationship with him, it seems to me that these traits should be increasingly operational in our lives both individually and collectively. If we are seeking hard after God, it should be these traits that define the church. Are visitors to my church enveloped by a sense of God’s steadfast love (lovingkindness in the NASB)? Is my congregations known for pursuing justice in the local community and around the world? Do I convey an accurate portrayal of true righteousness, that which is granted by God through a relationship with Jesus Christ? Notice that there is effort required on our part. We need to extend effort toward becoming what God wants us to be. But ultimately it is God who works these traits into us. We need to allow Scripture to shape our desires and submit to the leading of the Holy Spirit. This is a good news, bad news situation. The bad news is that we fall short in love, justice and righteousness. The good news is that God is not done with us. I normally tell you that you can click through to read these blog posts at the source where they first appeared, right? Well this time, you really should, because there are some graphics that go along with each of the 12 points. Today’s reading is also a scripture medley. We’re returning to Worship Sounds Music, the blog of Cynthia and Travis L. Boyd. When the very living of our lives has become an act of worship, recognizing God’s supremacy and worth in every decision and thought, worship is no longer an action but rather a lifestyle. It’s a 24 / 7 / 365 … every moment of every day … goal of intentionally expressing God’s glory in all that we do, think, and say. ** In seeking to live out this lifestyle and this heart commitment to the One who has given us His all, we give the only gift that we can give to our Creator and Savior: the gift of a transformed life that brings Him glory and joy! 1. Giving God THANKSGIVING and PRAISE! 3. Giving God AWE and REVERENCE, acknowledging Him as the Lord and Creator of all. 1. to raise or elevate in rank, position, dignity, etc. You have probably noticed by now that there is some overlap in the various types of giving to the Lord. For example, in singing praise to God, we can bless His name. In the worship category of giving, there is overlap with all other types of giving. All of these ways of giving to the Lord are worship (lifestyle worship) when we are giving with the purpose of bringing glory to God and expressing His infinite worth through giving our best to God in every area of our lives. 8. We are to SING UNTO HIM! 9. Giving Him TITHES and OFFERINGS! 12. Giving Him OUR WHOLE HEART AND LIFE! For us, giving these to God (worship, blessing, exaltation, thanksgiving, praise, glory, awe and reverence, love, honor, service, tithes and offerings, songs, and all that we are in life and in our hearts) is our gift of worship and devotion to Him. Giving is about worship, and worship is all about giving. GOD HAS GIVEN HIS ALL… and continues to give in every moment of time. May we follow His example. Today we look at another blog that is indexed with Faithful Bloggers. Morgan Murphy blogs at Look Upon The Light, and posted this in September. To read more click the title below, and then click the “home” button at the top to look around at other articles. I believe with all my heart in the Great Commission. Jesus’s last words should be our first priority. In Matthew 28, He says, “Go therefore and make disciples of all nations, baptizing them in the name of the Father and of the Son and of the Holy Spirit, teaching them to observe all that I have commanded you. And behold, I am with you always to the end of the age.” There is plenty of work yet to be done, and not enough willing to just go. We have to start taking Jesus for his word. I believe that someone can’t do everything, but everyone can do something. It is impossible for a single person to go to every place that needs the Gospel. As followers of Christ, we are all called to do something. Every person’s calling won’t take them across the country or around the world, but we all have a mission field. It might be the classroom, hospital, football field, study group, office, gym, wherever…the opportunities are endless. The important thing is to discover what you love and use your passion to fulfill your potential and God-given purpose. I believe in being dangerous to the kingdom of darkness. In 2 Corinthians 11 and 12, Paul talks about things he has suffered for the sake of the Gospel. He was stoned, beaten, imprisoned, and shipwrecked. He was in danger from rivers, robbers, his own people, Gentiles, the city, the wilderness, the sea, sleepless nights, and more (see verses 23-28). Let me tell you…I would rather be in danger while chasing Jesus than safe while chasing the American Dream. I don’t believe in playing it safe when something as serious as eternity is on the line. I believe that our God is global. John 3:16 says that God so loved this world. It does not say that God so loved the United States of America. We tend to be really ethnocentric, but the love Jesus has for all of us transcends any and all borders. It reminds me of the children’s Bible song that says red and yellow, black and white, they are precious in His sight…it really is true. I am aware that there are people in America that need help. There are people in our own backyards that need Jesus, and we should treat these people no different than Haitians or Ugandans or Indians or whoever. We can’t get so caught up in the ethnicity or geographical location that we neglect the status of the heart or knowledge of the Gospel. I believe in the sovereignty of the Lord. With Him, I have everything. Without Him, I have nothing. He will never misguide or mislead me. They say that the safest place to be is in the center of God’s will, and I so believe that. If Haiti is where I am supposed to be, then I am safer there than here. People die in motor vehicles accidents every day, but that doesn’t keep us from getting in our cars every morning. We have to stop letting fear dictate how we live our lives. Fear is not of the Lord. I trust the Lord with every bit of my heart, so I can rest assured that He is always with me…whatever happens will be okay as long as I know I am following the Lord. For to me to live is Christ, and to die is gain (Philippians 1:21). All of this and more is why I believe in going to Haiti. Thomazeau, Haiti will be my mission field. When I get home, things will be different. My mission field is usually the intensive care unit where I am a nurse. The key is to go with the flow and serve wherever the Lord leads you. Be the hands and feet of Jesus however and whenever possible. Let someone know that they are loved and chosen and accepted. Step up and do your part because we are living in critical times…the possibilities and opportunities are endless. Whatever your calling, let others see the wonder of Christ in you. That is what will make all the difference. 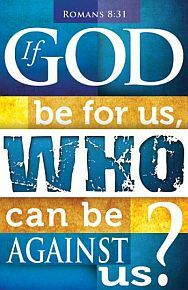 CEB* Romans 12:3 Because of the grace that God gave me, I can say to each one of you: don’t think of yourself more highly than you ought to think. Instead, be reasonable since God has measured out a portion of faith to each one of you. 4 We have many parts in one body, but the parts don’t all have the same function. 5 In the same way, though there are many of us, we are one body in Christ, and individually we belong to each other. 6 We have different gifts that are consistent with God’s grace that has been given to us. If your gift is prophecy, you should prophesy in proportion to your faith. 7 If your gift is service, devote yourself to serving. If your gift is teaching, devote yourself to teaching. 8 If your gift is encouragement, devote yourself to encouraging. The one giving should do it with no strings attached. The leader should lead with passion. The one showing mercy should be cheerful. 9 Love should be shown without pretending. Hate evil, and hold on to what is good. 10 Love each other like the members of your family. Be the best at showing honor to each other. 11 Don’t hesitate to be enthusiastic—be on fire in the Spirit as you serve the Lord! Today we pay a return visit to the blog of B. J. Rutledge, pastor of Grace Fellowship Church in Paradise, Texas. Click the link below to read the article at source. Romans 12:1 & 2 have long been favorites of mine, but today as I was reading Romans 12, I got really focused on the next few verses and had to admit I’m not doing as well with them as I’d like. If we’d all work on them, I think church would be even better than it already is! Filter every thought about yourself through Christ; don’t compare yourself to anyone else. We belong to one another; we’re family and we don’t all have the same function. Family is difficult at times because we’re so different & grace is needed because we don’t all respond the same way…and by the way, God set it up this way (so go figure). 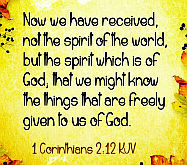 We all have gifts – given to us by God through His grace, so whatever gift we’ve been given IT’S FROM GOD & THAT’S GOOD! Quit desiring someone else’s gift & be thankful for what God gave you, and USE IT! We’re to love each other; it’s that simple and profound. This reminds me of a question Andy Stanley posed a while back: “What does love require of me?” In other words, RIGHT NOW – IN THIS INSTANT – IN THIS SITUATION – WITH THIS PERSON…What Does Love Require of Me? This should be self explanatory! Christians, we’re not just to ask: “What does love require of me?” WE’RE TO BE DEVOTED TO ONE ANOTHER IN LOVE. Oops; how are we doing with this? We’re to be so devoted we actually GIVE PREFERENCE to ONE ANOTHER – and HONOR ONE ANOTHER. Let’s give this a lot more effort this week – month – year – and begin today! DON’T BE LAZY in using what God’s given you when it comes to SERVING HIM & HIS CHURCH. Diligence has to do with our ACTIONS. BE FERVENT IN SPIRIT has to do with having an enthusiastic attitude about serving Christ! Serving Christ through His Church is one of the greatest privileges in the world so demonstrate your gratefulness in Action & Attitude and get busy SERVING! *I frequently refer to the Common English Bible. Published just a few years ago, it’s target market is the more liturgical Protestant churches who have historically used the NRSV.